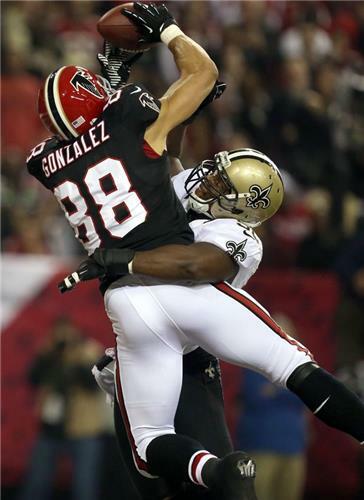 TIM -- Any chance Tony Gonzalez will decide to come back? With this season being such a let down, would he want to come back to try and end it on a better note? LEDBETTER – He signed a two year contract, but this looks like the end. I think he’d wait and study the offseason moves first. STAN -- Do you think that the offense would have been had the same results if Jason Clabo and Todd McClure were still apart of the team? LEDBETTER – No. They would have been able to block some people. MG -- How much of this year's dismal season should we place on Coach MS and GM TD? Plenty of other NFL teams were hit by the injury bug and seemed to play through it yet the Falcons seemingly collapsed. LEDBETTER – They deserve much of the blame for the decisions along the offensive line, letting Tony stay away from camp and for trying to play Roddy while he was hurt. It’s been a complete all around failure and I’m sure they’ll take their share of the blame. RICHARD -- This team was never built to win. look at the New England, they ran out 7-11 rokies this season, not to mention pretty much an all rookie receiving corp. They are still in the playoffs and still in position for a first round bye- a team built to win no matter the situation. Now look at the falcons- they knew going into the summer the right side of the offensive line was going to be an issue and they never addressed it. I think their comment in the paper was, we feel who we have on the roster is good enough. Well even I, who has never played a down of pro football could see that, if they were good enough they wouldn't have been sitting on the bench last year! Now look at the defense. They were bad last year, so how do they fix it, they release or let go Grimes, Robinson, and our only pass rusher in John Abraham. So they bring in rookies and again only one pass rusher in Osi. So a team that could not rush the passer last year feels like bringing in only one pass rusher is the answer??? Well as we know now that didn't work out. Have the falcons been hit with injuries, sure, so have every other team in the NFL But look at the team now, only Baker and Jones are out on the offensive side of the ball. And we still can't run and the deep threat is no where to be found. The defense is missing, what maybe 1 or 2 people. So I ask is/was this team ever built to win. LEDBETTER – Blocking and tackling were major problems for the 2013 Falcons. CHRIS CHANDLER -- What pending free agents do you think the falcons will target next year? LEDBETTER – Haven’t gotten to studying free agency yet. That’s not an in-season project. CEDRIC -- With the Oline blocking a little better does that sway your decision on where to draft first next year ? LEDBETTER – No. They still need a horse to lead the plow on the oline. If one is available (Matthews) take him. KELVIN SCOTT -- The falcon's season did not go as many fans expected. The team has stated that it will build through the draft. What will the team do different to ensure that the positive steps over the last few years don't push us back to the old days of the Smith ownership? This team has to contend for a super bowl in the next few years. LEDBETTER – They will continue to develop and add players. Also, they will try to stay healthier in the future. JSSN -- Will late February look like a episode of Game of Thrones in Flowery Branch? How many folks are gonna hit the bricks (players, coaches, support staff)? DOL – There will likely be some change. JSSN -- Will Goodell come to town to see Gonzalez off to the NFLPA retirement fund? DOL – I don’t know. Barr, UCLA LB. There's going to be a baller there to take. Snap him up and keep it moving. Who do thy takeif Matthews ad Clowney are gone? Any chance of a rade down? Pretty disappointed we aretalkin aboutthe draft and the season isn't over. THANKS FOR DROPPING BY!!! HAVE A MERRY CHRISTMAS. We'll be back for the final regular season mailbag next Friday. They'll be trying to upgrade across the board. They'll may have to stay young (cheap) at MLB. Thank you for dropping by Barko! I agree. Thanks for being accessible through this Q&A Mr. Ledbetter. NO. Take LT Jake Matthews and keep it moving. If Clowney isn't available when the Falcons pick in the draft, do you still think they will take a DE or another position? BARKO -- NO! This isn't the NBA. Do you think any team is purposefully tanking to get a better draft spot? Last question from me... Is it too early to call Konz a bust? As well as the rest of that draft class? The Atlanta Falcons Cheerleaders were fired up at the Georgia Dome on Sunday as the Falcons beat the Redskins. 3 to 5. I think Houston and Washington will be 1-2. Predicted draft spot? Predict 2 loses to end season?